Morning scribble fans, another puzzler for you this morning. 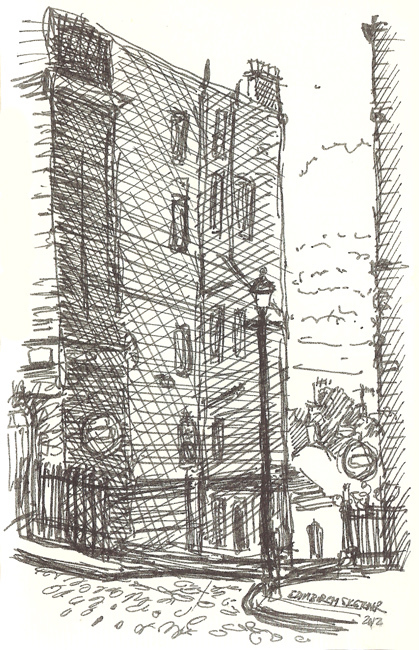 Do you recognise this sketch from Edinburgh, I’m sure a number of you walked past this scene on your way into work this morning. If you’re not sure then have a guess, it could earn you valuable points on the WhereArtI? leaderboard. And please remember to RT and forward this on. The sketch is black ink in my wee A6 moleskine pocket sketchbook. Congrats to everyone on twitter who entered this weeks WhereArtI? quiz, it was in fact the top of the hill that leads down a narrow cobbled lane into Stockbridge and the wee square that is home to the weekly Stockbridge Market. The name I was after is Gloucester Lane.